Stockpair, founded in 2010, is a binary options broker with its own trading platform and regulated by CySEC. It has carved out its position on the binary options market by offering the feature of pairing different assets against each other, such as Apple against Microsoft, Google against Nasdaq etc. Since 2012 Stockpair has also been offering binary options and has stood out with its large range of tradable stock market assets. Traders that deposit for the first time receive a welcome bonus up to 100%, depending on the size of the first deposit. The minimum deposit is $200. Stockpair’s platform is web based and developed inhouse. Making the platform easy to use was clearly an important mission for the developers, because the platform is very clear and works smoothly. Stockpair has a patent pending for its trading platform at the U.S. patent office. Stockpair offers every new trader a welcome bonus of up to 100%. The exact percentage is frequently changed and also dependent on the height of your first deposit. Aside from the standard account, for which the minimum deposit is $200, Stockpair offers 4 other account types, also dependent on the amount of funds in your account: Silver, Gold, Platinum and VIP. The advantages of these accounts have to do with more coaching, more trading tools and of course the ability to open bigger positions. Stockpair’s binary options trading platform is web based and one of the most userfriendly we have encountered. In the main menu you can select binary options - where you can predict the price development of 1 asset - or pair options, where you can predict the price development of 2 assets compared to each other. 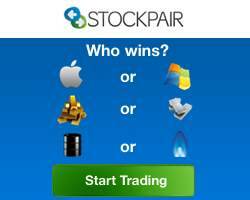 By offering both ways of trading, Stockpair sets itself apart from many other binary options brokers. In case of the binary options section, Stockpair offers a wide variety of experiration dates, ranging from 5 minutes to 150 days. Obviously you can adjust the height of your investment as well, and you can also choose to close trades with a longer runtime after one hour, win or lose. Stockpair offers 150 different assets in forex, commodities, indices and stocks, but its main strength is in stocks, with assets from 7 international stock markets. Stockpair also offers a demo account for practice purposes, but only for traders that already have deposited funds into a live account. The minimum deposit at Stockpair is $200. Deposit methods are, among others: credit card, moneybookers, neteller and bankwire. Depending on which country you are from, local online payment methods are often also offered. The customer service is available 5 days a week during trading hours, via chat, email and phone. Customer service is available in several languages and the response times we encountered were very good. Stockpair was founded in 2010 in Cyprus, EU. It is regulated by the Cyprus Securities and Exchange Commission (CySec), License No. 229/14. Stockpair offers traders a wide range of trading possibilities in binary options as well as pair options, with the latter being a feature that distinguishes it from many competitors. Its inhouse developed platform is web based, fast, clear and smooth, and this is obviously one of Stockpair’s strongest points. A demo platform is also available, but unfortunately only for traders with a live account they have already funded. In our opinion Stockpair would do well to make the demo platform more widely available, as this would advertize its strongest point, the platform. In short: for traders looking for a userfriendly trading platform and a wide variety of trading ways, Stockpair is certainly worth a try.